Expression – Alert and eager, but with the soft expression of a bird dog. Eyes – Well set in head. Well protected from briars by a heavy, expressive eyebrow. A prominent full or popeye should be penalized. It is a serious fault in a dog that must face briars. Skull well chiseled under the eyes, so that the lower lid is not pulled back to form a pocket or haw that would catch seeds, dirt and weed dust. Preference should be for the darker colored eyes, though lighter shades of amber should not be penalized. Light and mean-looking eyes should be heavily penalized. Neck – Medium length. Free from throatiness, though not a serious fault unless accompanied by dewlaps, strong without giving the impression of being over muscled. Well set into sloping shoulders. Never concave or ewe-necked. Topline – Slight slope from the highest point of the shoulders to the root of the tail. Chest-Deep, reaching the level of the elbow. Neither so wide nor so rounded as to disturb the placement of the shoulders and elbows. Ribs well sprung. Adequate heart room provided by depth as well as width. Narrow or slab-sided chests are a fault. Back-Short and straight. Never hollow, saddle, sway or roach backed. Slight drop from the hips to the root of the tail. Flanks-Rounded. Fairly full. Not extremely tucked up, or flabby and falling. Loins short and strong. Distance from last rib to upper thigh short, about three to four finger widths. Narrow and weak loins are a fault. In motion, the loin should not sway sideways, giving a zig-zag motion to the back, wasting energy. Shoulders – Shoulder blades should not protrude too much, not too wide apart, with perhaps two thumbs’ width between. Sloping and muscular. Blade and upper arm should form nearly a ninety degree angle. Straight shoulders are a fault. At the shoulders, the Brittany is slightly higher than at the rump. Front Legs – Viewed from the front, perpendicular, but not set too wide. Elbows and feet turning neither in nor out. Pasterns slightly sloped. Down in pasterns is a serious fault. Leg bones clean, graceful, but not too fine. Extremely heavy bone is as much a fault as spindly legs. One must look for substance and suppleness. Height at elbows should approximately equal distance from elbow to withers. Dense, flat or wavy, never curly. Texture neither wiry nor silky. Ears should carry little fringe. The front and hind legs should have some feathering, but too little is definitely preferable to too much. Dogs with long or profuse feathering or furnishings shall be so severely penalized as to effectively eliminate them from competition. Skin – Fine and fairly loose. A loose skin rolls with briars and sticks, thus diminishing punctures or tearing. A skin so loose as to form pouches is undesirable. Broad strong and muscular, with powerful thighs and well bent stifles, giving the angulation necessary for powerful drive. Hind Legs – Stifles well bent. The stifle should not be so angulated as to place the hock joint far out behind the dog. A Brittany should not be condemned for straight stifle until the judge has checked the dog in motion from the side. The stifle joint should not turn out making a cowhock. Thighs well feathered but not profusely, halfway to the hock. Hocks, that is, the back pasterns, should be moderately short, pointing neither in nor out, perpendicular when viewed from the side. They should be firm when shaken by the judge. Feet – Same as front feet. Brittanys are smaller than setters but leggier than spaniels, standing about 20 inches at the shoulder. Their beautiful, boldly patterned coat comes in combinations of white and vivid orange and liver (reddish-brown). They are rugged and strong but smooth, clean, and quick afoot. The face has the “softness” prized by bird-dog lovers; high-set ears convey the breed’s essential eagerness. The zeal and versatility that make Brittanys peerless hunters can be channeled into dog sports. Obedience, agility, flyball, dock diving—you name it, this trainable breed is up for it. The Brittany is a nice fit for those seeking an all-purpose hunting partner, a dog-sport teammate, or a companion in sync with an upbeat, outdoorsy family life. The Brittany should do well on a high-quality dog food, whether commercially manufactured or home-prepared with your veterinarian’s supervision and approval. Any diet should be appropriate to the dog’s age (puppy, adult, or senior). Some dogs are prone to getting overweight, so watch your dog’s calorie consumption and weight level. Treats can be an important aid in training, but giving too many can cause obesity. Learn about which human foods are safe for dogs, and which are not. Check with your vet if you have any concerns about your dog’s weight or diet. Clean, fresh water should be available at all times. The Brittany’s flat or wavy coat is mostly fairly short and requires minimal grooming. A once-over with a soft brush or hound glove and a quick comb-through of his featherings should keep him looking his best. For the show ring there is some light trimming done to neaten the dog’s head and neck. The underside of the ears should be inspected regularly and wiped clean if needed, and the nails trimmed every month if not naturally worn down. 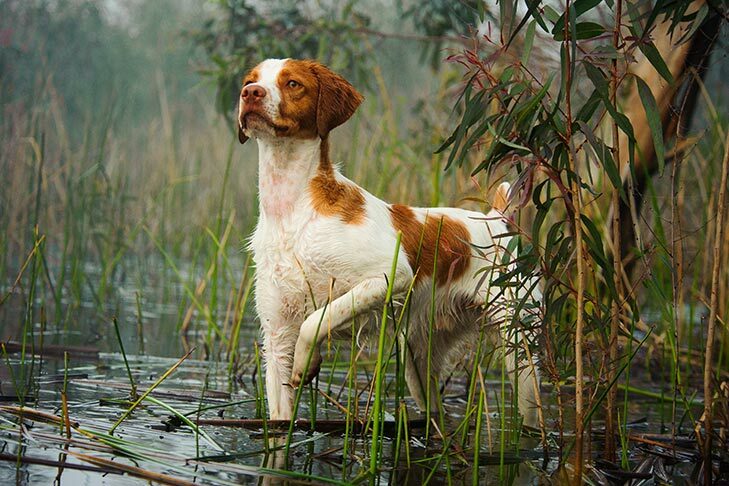 The Brittany is a bright, high-energy dog who is bred to hunt, and he needs lots of exercise. Brittanys are a good fit for those seeking an all-purpose hunting partner, a dog-sport teammate, or a loyal companion suited to a lively, outdoorsy family life. He enjoys long, brisk walks and hikes or running on a leash alongside his human, as well as a wide variety of activities that occupy both his mind and his body. As well as field trials, other canine events such as agility, FAST CAT® , and dock diving provide great outlets for the breed’s talent and boundless energy. The Brittany is lively and smart and has an upbeat, willing disposition. The energy, versatility, and extraordinary working ability that make Brittanys shine as hunting dogs can be channeled into dog sports. Field trials , obedience, agility, flyball—you name it, this trainable breed is up for it. Patient, encouraging training works best with these gentle souls. As with all breeds, early socialization and puppy training classes are recommended. The Brittany is a very healthy breed, with few genetic health issues. A responsible breeder will screen breeding stock for health concerns such as hip dysplasia and eye disease. Ears should be checked regularly to remove foreign matter and avoid a buildup of wax, and the teeth should be brushed regularly. Brittany is the westernmost region of France, surrounded by the English Channel to the north and the Bay of Biscay to the south. It was here, hundreds of years ago, that French hunters developed what is today considered one of the world’s most versatile bird dogs, capable of working on duck, woodcock, pheasant, partridge—just about anything with feathers. The Brittany first comes into historical focus in paintings and tapestries of the 17th century. The frequency with which Brittany-type dogs appear in the portraits and pastoral scenes by French, Flemish, and Dutch masters of the period suggest that liver-and-white pointing dogs were quite common in Western Europe. The Brittany is a rustic dog whose original devotees were medieval peasants and poachers, people for whom thriftiness was a way of life. Unable to support a full kennel, they placed a premium on dogs capable of being all-purpose workers. The versatility bred into Brittanys in the long-ago French countryside has never left the breed. The Brittany was introduced to America in 1931. 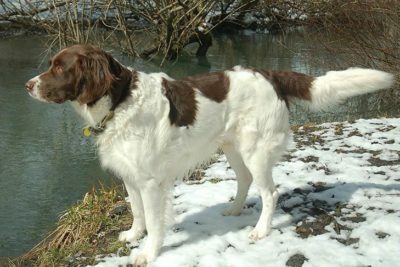 In 1934, the AKC registered its first dog of the breed, then called the Brittany Spaniel. (In France, the breed is still known as “l’épagneul Breton,” or Brittany Spaniel.) During the 20th century, American and French lines diverged. 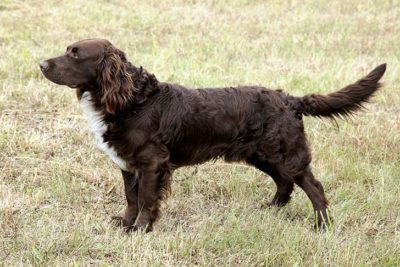 By mid-century, the U.S. breed fancy considered their Brittanys more pointers than spaniels in working style, and the AKC breed named was shortened to Brittany in 1982. Under any classification, Brittanys are happy, durable hunting companions prized for stamina and an excellent nose for birds. They are among America’s most popular and successful field dogs. Over the years, hundreds of Brittanys have earned the AKC’s elusive Dual Champion title, indicating a dog that is both a handsome showman in the ring and a capable gundog in the field. The Brittany was named for the French Province in which it originated. September 1, 1982 its official name was changed to Brittany. First Brittany standard outlined in 1907; introduced to the US in 1931. 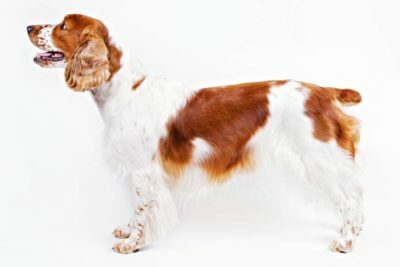 From 1934-1982, the Brittany was registered by AKC as Spaniel, Brittany. 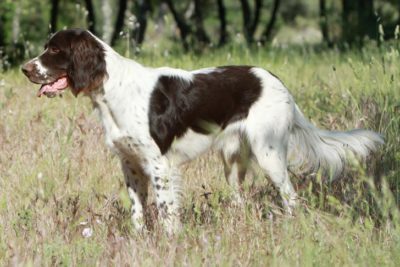 The Brittany enjoyed a steady gain in popularity in us due to its merits as a shooting dog; many Brittany breeders still strive for the "dual" Brittany (i.e., good in the field and the ring). The first accurate records to pinpoint the actual brittany-type dog are the paintings and tapestries of the 17th century.